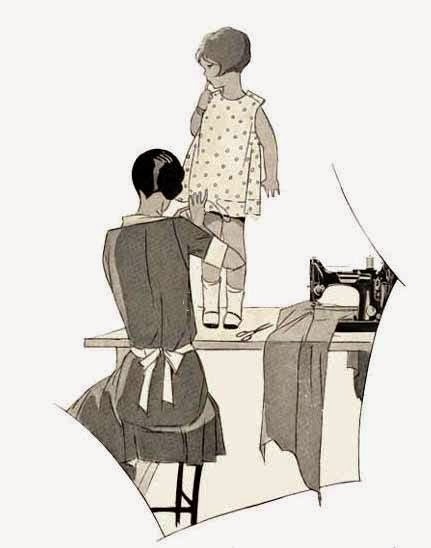 AUNTY HENNYS: JOINING THE QUILT BACKING............PATTERN MATCHING ! JOINING THE QUILT BACKING............PATTERN MATCHING ! I had some leftover embroidery blocks for a Farm quilt as I had made a mini version late last year using only 5 blocks so I decided to make another mini version to have on hand if I needed a quilt in a hurry! Glad to use up some more scraps. On Sunday we had lunch with our friends and we discovered they were grandparents again to a baby boy....... so suddenly the "spare" farm quilt is not a spare anymore! Today I found some backing fabric for it but it was only 40" wide and my quilt flimsy is 38" square. I like at least 4" excess batting and backing all the way around a quilt so I decided to piece the backing with just one seam down one side. This farm fabric is perfect! I have always wanted to have a go at joining a backing using the method where you pattern match....... you can read about this method HERE. Always make a note of the measurements! My short piece of backing fabric = 46"
My long piece measured 46" + pattern repeat of 12" = 58"
Get your Elmer's Washable School Glue out!! the pattern matching on the bottom piece. pins in until I pressed with my iron to set the glue. gets trimmed off after sewing. Washed and pressed ready to layer the quilt! I will be quilting this one on my Featherweight. I think it's small enough to manoeuvre through the throat space of the machine. Quilting on the Featherweight is just so enjoyable. Perfect stitches on the front and back. I'll do some Walking Foot quilting and maybe some Free Motion Quilting too! So tomorrow I hope to start the quilting! 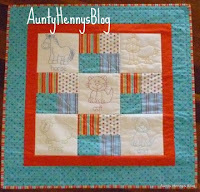 That is such a nice baby quilt and your back piecing went together perfectly.